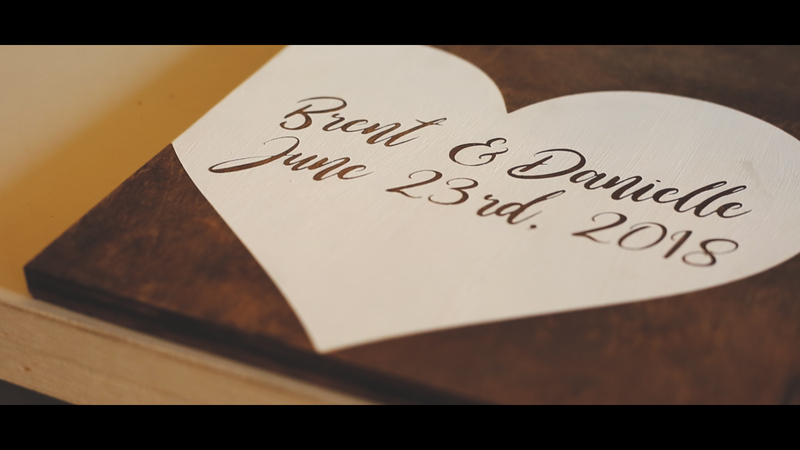 On June 23rd of 2018 Danielle and Brent Anderson were wed at Bear Creek Ranch Event Center in Nevada, Texas. Skys the Limit Production was given the honor of capturing their wedding day. Before the ceremony Brent and Danielle exchanged gifts. Danielle received a watch. Brent was given a belt buckle with he letter “A” on it. Danielle then surprised her daughter with a necklace to wear proudly as she paraded down the aisle bringing with her; a trail of flowers. The couple beamed as they read their letters. Their love jumping off the page. During some down time before the wedding the groomsmen enjoyed their cigars as the girls sat on their rocking chairs with their robes and sipped champagne. Danielle wore a beautiful long fitted dress that appreciated her body, the buttons on the back making a delicate uniformed line down her spine. The dress was accompanied by cowboy boots with a hint of teal decor. Brent sported a navy jacket with a warm yellow tie and jeans. This was all tied together with his black cowboy hat. The Bride’s daughter, Sarah, was the flower girl. The ceremony had a southern rustic feel. The soft decorations complimenting the wood. The sun was high in the sky, the pond behind them glistened in sparking brilliance. Skys the Limit Production captured this breathtaking moment on video for the couple. Guests cheered as the couple made their grand entrance with the flower girl and sat at their Mr. and Mrs. table. Like any southern gathering, barbecue was served while guests played games. There was a live band serenading the couple with country love songs. The Bride’s cake was tall with pink and purple flowers decorated around and the groom’s cake was a decorated Copenhagen snuff cake. The couple were sweet and fed each other cake gently. During the bouquet toss, the Bride playfully tricked the group of girls she was going to throw the flowers. When she did throw the bouquet, the maid of honor caught the flowers. The best man was shy about giving his toast, but left a heartwarming wish to the couple and a hug with the groom. The bride danced with her groom, but made time to dance with her daughter as well. In a completely unique sendoff the couple and guests got to enjoy their own fireworks show – after the show the guests surrounded the couple with sparklers while they proudly walked through as Mr & Mrs.